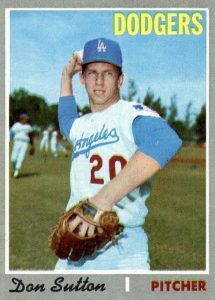 A legend for the Los Angeles Dodgers, Don Sutton baseball cards first got underway with 1966 Topps. Pitching for 23 seasons, he naturally appeared in many other releases of note during his career. 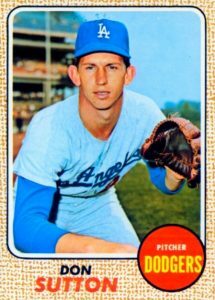 This list reviews some of Sutton's key baseball cards including several Topps sets of the late 1960s. 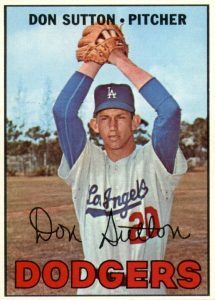 Don Sutton debuted in 1966 as part of a loaded Dodger's pitching staff that included Sandy Koufax and Don Drysdale and he would spend 16 seasons with the team. Although he only had one season with 20-plus wins, he ranks in the top ten all-time for strikeouts, shutouts, and games started. 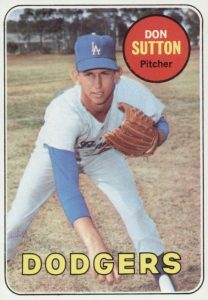 Sutton's 324 career wins were good enough for induction into Cooperstown in 1998 and he became the first Los Angeles Dodgers player to go from prospect to the Hall of Fame since their move to California. 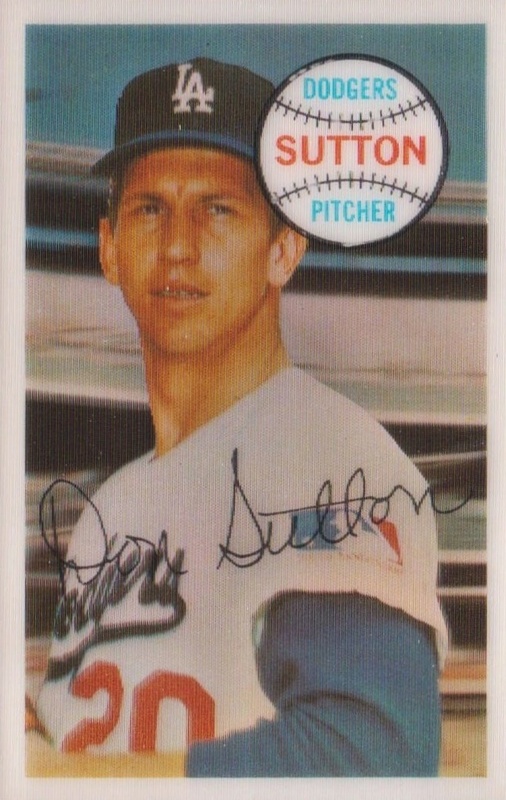 Shop for Don Sutton autograph cards on eBay. As a frequent signer in high-end baseball sets, there are few examples that didn't make the list but are still worth noting. Sutton is placed with former teammates Burt Hooton and Tommy John on a triple autograph card found in 2004 Upper Deck Legends and he is teamed with Duke Snider on a dual autograph in 2005 Donruss Signature Series. In 2006 Ultimate Collection, Sutton is part of a trio of great pitchers from the 1970s, including Gaylord Perry and Luis Tiant, for a Legendary Ensemble triple autograph. Another memorable Don Sutton autograph in the 2005 Upper Deck Sign of Cooperstown insert teams him with Nolan Ryan and Robin Roberts. Although sometimes overlooked in favor of other power pitchers, Sutton's longevity and consistency made him one of the best pitchers of the 1970s. Because his top cards are sometimes skipped by collectors, those looking for deals on the top Don Sutton cards can usually find good value. In determining placement, card value was the key component, along with card design and an emphasis on his earlier appearances. Sutton was included in the very first Kellogg's 3-D Super Stars set. The 3-D cards featured two images: the stadium background, which is out of focus, and the player photo. On top of that, a layer of slightly ridged plastic gave the card a textured effect. A combination of the printing process and the narrow size of the card compared to the norm, makes the cards bend and it may require a top loader for long-term storage. Like many of the Topps sets of the day, 1970 Topps was issued over seven series and collectors can find Sutton's card in the sixth series. While the 7th series in Topps sets are typically the high-number cards, the 6th series cards in the 1970 set get a slight value boost and are sometimes referred to as "semi-high numbers" by set builders. 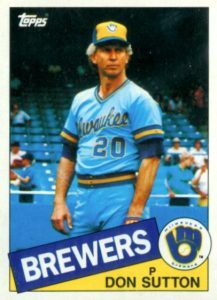 The back of the Don Sutton card makes reference to a no-hitter he threw in college where he still ended up as the losing pitcher. Sutton would pitch five one-hit games but never captured a no-no in the majors. It is easy to think of Topps exclusively as a baseball card entity and forget that their start was as a candy company. As such, the cards were an incentive for kids to buy the candy rather than the other way around. 1973 Topps Candy Lids puts that into perspective as the "cards" in the set served as the lid for a package of bubble gum. In total, there are 55 different lids to collect with the reverse featuring an ad for Baseball Stars Bubble Gum. 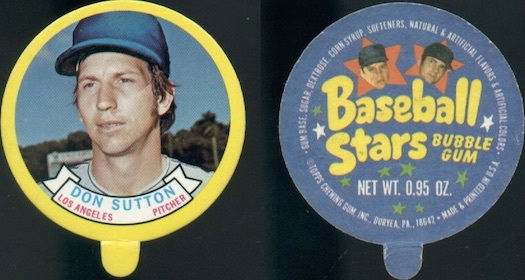 Sutton was also featured in the hard-to-find Candy Lid test issue from 1972, but that lid is very rare. The backs of 1969 Topps cards frequently included cartoon illustrations along with an interesting fact about the player. A cowboy is shown at bat on Sutton's card to represent his time in the Texas League farm system. By spending nearly all of his career in the National League, Sutton racked up an incredible amount of at-bats without ever hitting a home run. In total, he took 1,354 trips to the plate without a dinger and produced a dismal .144 career batting average. 1968 Topps has the distinction of featuring a primary design that Topps has never brought back to their flagship set. Although the burlap design hasn't been repeated yet, fans can see it again in 2017 Topps Heritage. Sutton's 1968 card features him in a standard pitching pose and the reverse talks about how he was a contender for 1966 Rookie of the Year before hurting his arm. While he is sometimes credited with never spending time on the disabled list, Sutton did spend three weeks on the DL during his final season. Part of an incredibly small print run, the 1985 Topps Mini test issue card for Sutton is one of his rarest appearances. Only 132 cards in flagship 1985 Topps were given the miniature treatment, which corresponds to the six 132-card printing sheets Topps used to create their main 792-card set. Printed on white cardboard, similar to some Topps Traded sets, Sutton examples have been found with a blank back as well as with the regular statistical information on various colors. 1974 Topps Deckle Edge was inspired by the 1969 Topps set of the same name with a slight design change, making the 1974 cards taller than the original release. Like the '69 edition, a blue facsimile autograph and the famously trimmed edges are the main design elements. The 1974 Deck Edge test set was issued around Massachusetts, as the story goes, and has enjoyed a popularity with collectors as being an oddity issued by Topps that never quite caught on. While Sutton has signed for more recent Panini releases, collectors looking for his first certified autographs should check out 1998 Donruss Signature Series. 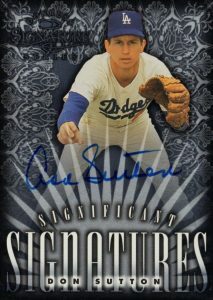 The Significant Signatures subset featured 18 all-time greats, including Sutton, and each card is serial numbered to 2,000 copies. Sutton's autograph style is notable in that the two largest letters in his signature—the "D" in Don and "S" in Sutton—look like an "A" and "D" at first glance. The cross on the "tt" in Sutton is often done above the letter rather than through them, as well. Sutton's first solo baseball card came in 1967 Topps and he is shown raising his arms to start his windup. 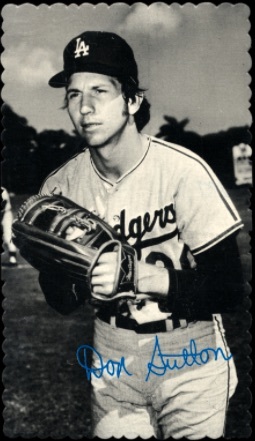 Much like his Dodgers teammate Sandy Koufax, Sutton would initially struggle as a starting pitcher, going 51-60 over his first four seasons before getting his first winning season in 1970. The back of the card lets us know that Sutton's first career victory came against the Houston Astros. He would eventually join the Astros in 1981 after becoming a free agent. 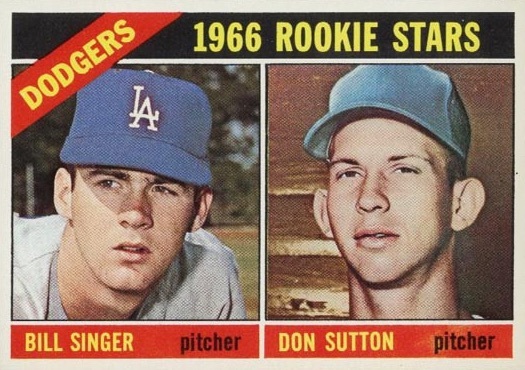 Glancing at the 1966 Topps Don Sutton rookie card he shares with Bill Singer, you might be surprised to learn that Singer has more career 20-win seasons than the Hall of Fame pitcher. Sutton went 21-10 in 1976 while Singer was 20-12 in 1969 and 20-14 in 1973. However, it is Sutton's incredible career consistency of 15 or more wins in a season 12 times that sets him apart from other pitchers. Mint examples from '66 are rare and even near-mint grades for Sutton can top $300 at auction.